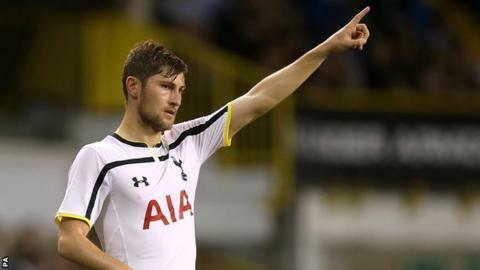 Ben Davies is excited by the prospect of facing his former team-mates when Tottenham Hotspur take on Swansea City in the Premier League. Defender Davies, 21, joined Tottenham from Swansea in the summer in a swap deal which took Gylfi Sigurdsson to the Liberty Stadium. The Wales international initially struggled to break into the Spurs team, but is expected to face Swansea on Sunday. "It's a big one for myself," he said. "I'm excited to go back home and it's going to be a big occasion for me." Davies burst into the Swansea first team following an injury to fellow Wales full-back Neil Taylor at the start of the 2012-13 season. He established himself as the Swans' first-choice left-back under then-manager Michael Laudrup, and earned his first international cap in October 2012. Davies remained first choice following the departure of Laudrup in January 2014, where he played under interim manager Monk before joining Tottenham during the summer of 2014. Neath-born Davies believes Monk has done an excellent job for Swansea, who are eighth in the table ahead of Sunday's game against 10th-placed Spurs. "I'm pleased for him. He's always been very determined to succeed," Davies said. "He was one of the ones who looked after me when I was breaking into the first team, and he gave me a lot of good advice. "He was superb for me when he was a manager as well, so it's going to be strange coming up against them. "If anyone knows my game better than myself, it's him. It's going to be a good game." Monk says Tottenham have yet to see the best of Davies, who struggled to break into the first team upon his arrival at White Hart Lane. Danny Rose has been his rival for the left-back berth although Davies has played in Tottenham's last four Premier League games. "It's a good rivalry, and it can only be good for the club," Davies said. "It is a battle. I took nothing for granted coming to this club, and I expected every battle I was going to get. "I'm going to keep working hard and being as driven as I can to make that number one spot my own, and I'm sure that's the same feeling Danny has got as well."